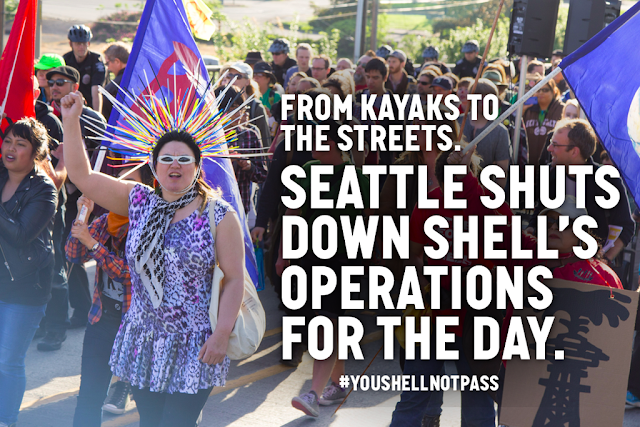 On Monday 18 May 2015, over five hundred people blockaded Port of Seattle Terminal 5 where Royal Dutch Shell's Polar Pioneer oil rig is docked. Shell is planning to do exploratory oil drilling in the Chukchi Sea in the Arctic off the Alaska coast despite climate scientists saying we cannot afford to drill for oil in the Arctic for a safe climate and the environmental risks dangers if a major oil spill were to occurr in the Arctic. In December 2012 it's oil drilling rig Kulluk ran aground off Kodiak Island while it was being moved from Alaska to Washington State to avoid paying $6 million in taxes. Protestors started gathering before 7am before marching to blockade the terminal front gate. Here is how the day unfolded. There is a great live ustream video report from KPFA community powered radio from Berkeley California. The Pacific Climate Warriors want to send a statement of gratitude and support for your upcoming rallies and actions on May 16-18th opposing Shell’s attempts to drill for oil in the Arctic. Last year, 30 of our Pacific Climate Warriors from 12 different Pacific Island countries paddled our traditional hand-carved canoes into the Port of Newcastle in Australia to blockade one of the largest coal shipping terminals in the world. We were supported by hundreds of Australians in kayaks, and from thousands of people on land as we declared that we wouldn’t allow the fossil fuel industry to destroy our cultures and lands. We Are Not Drowning – We Are Fighting! This action marked a turning point for us, in realizing that we cannot merely hope that the governments of our small countries will save our communities from the climate crisis. Rather, our focus must be on building large social movements that can work across cultures and differences – creating the political power necessary to challenge the world’s largest corporations. Science tell us that we must keep carbon in the ground and end the age of fossil fuels, but companies like Shell and their relentless pursuit of drilling in the Arctic set us on a path of catastrophe. Just as our tiny canoes stared down giant coal ships, your kayaks will stare down Shell’s massive oil drilling rigs – a modern day battle of David vs. Goliath. A battle that together, we will win. Thank you for your hard work and organizing. The climate crisis is a global one, and it demands that we build movements that are global as well. As you are confronting Shell’s massive Arctic drilling rig in Seattle just as we confronted massive coal barges in Newcastle – we stand together in solidarity so that neither of our communities are destroyed by the reckless drive of the fossil fuel industry.